Our house has been filled with warm fuzzies all week. You might recognize them as pompoms. I recognize them as coming from the craft bin that used to be too high for my kiddo to reach. They’re in corners. Under bedside tables. Sprinkled in among the shoes. And I had a big pile – accompanied by this explanatory note – on my dresser. The p 25ile on my dresser has grown as I collect others from amongst the dust bunnies while vacuuming. I’ll repurpose them again – sometime soon. 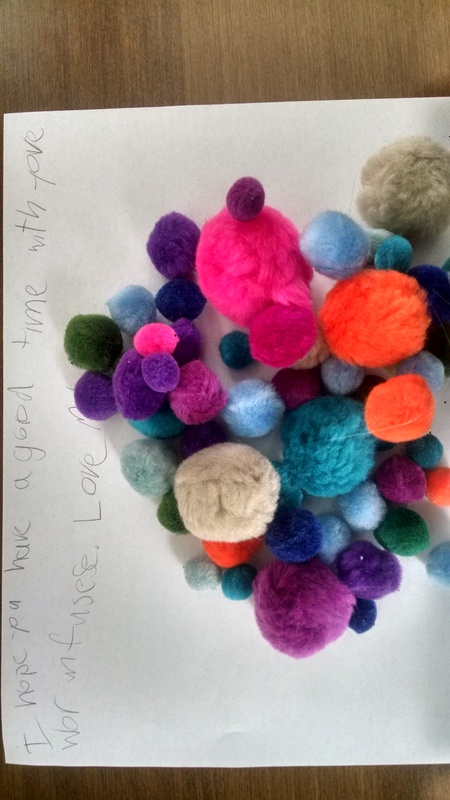 But for now, they’re a colorful, warm fuzzy reminder of my son’s overflowing love.